3rd district, Kis Korona Street 52. How are you, my son, and your mother and sisters? What are the news about Feri? Endre and the Német kid are here. If you get this card, please go immediately to my parents, and let them know, in case they have not received their card. 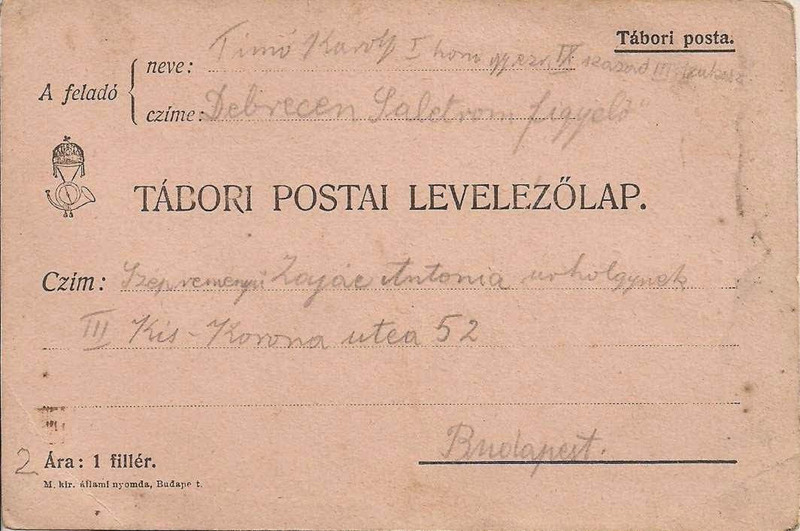 [The letter reveals that he was enlisted in one of the largest Hungarian fighting units, the 1st Royal Infantry Regiment. 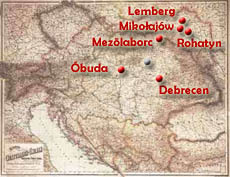 From the Hungarian border they were transported without pause directly to the Galician theater of war, and immediately put in action in the Rohatyn area, as part of the front concentrated for the liberation of Lemberg, which was attacked and later occupied by the Russians. After the unsuccessful operation, a general retreat was ordered, so after almost a month they came back to the border, next to Mezőlaborc. This time, however, from the opposite direction. Things have evolved differently from the plan. 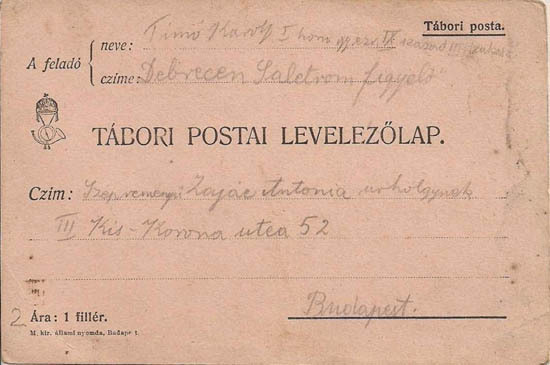 One month has passed, and the young soldier sends his card from the Salétrom Street Barracks and Hospital in Debrecen. He was wounded in his right arm. In the style with his previous letter: while playing soldier, he got a boo-boo on the arm. The injury might have happened a few days earlier, probably in the battles around Mikołajów. Something joyful in the pain, for during his convalescence they can meet, and maybe by then there will be peace, too. 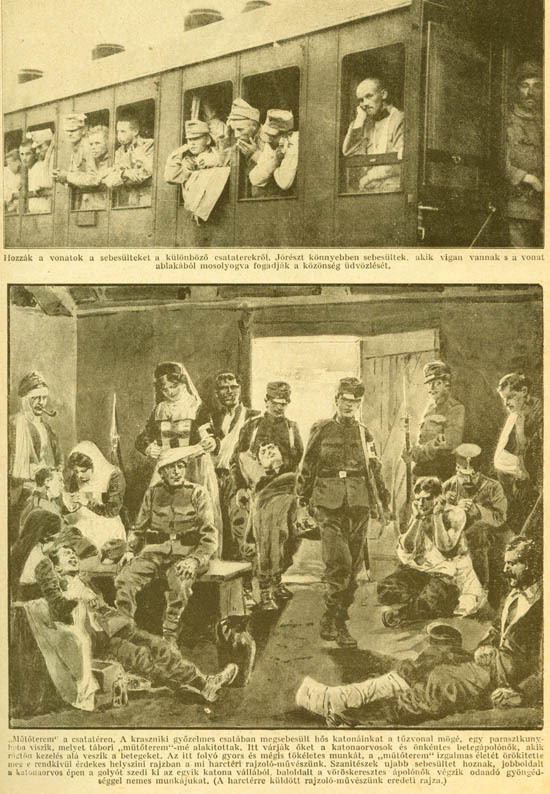 Wounded Hungarian soldiers, transported from the Galician front and looked after in the hinterland, a few days before the postcard was written. 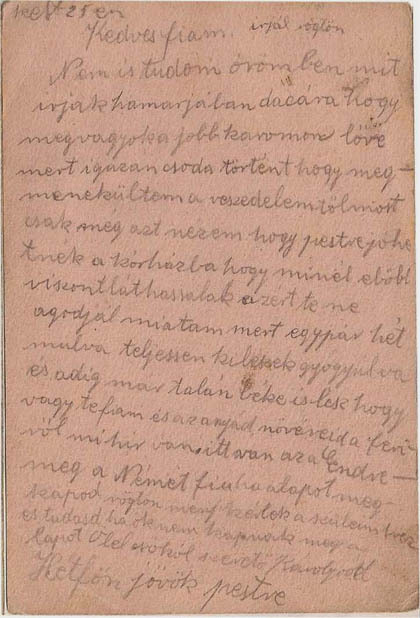 Tolnai Világlapja, 20 September 1914.